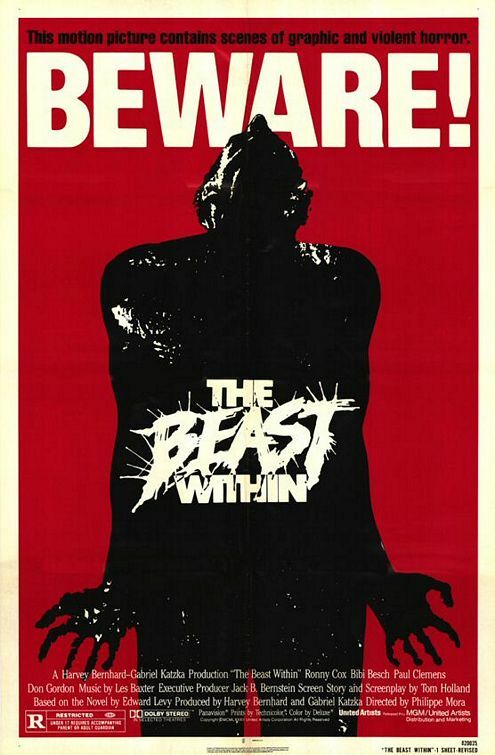 The Beast Within is a horror film loosely based on Edward Levy’s 1981 novel of the same name. The film opens in 1964 Nioba, Mississippi with newlyweds, Caroline and Eli MacCleary, stranded on a deserted road. Caroline is knocked unconscious and raped by an unknown entity. The film then picks up 17 years later in Jackson, Mississippi, and depicts the trials of the MacCleary family as it deals with unexplained symptoms of their 17-year-old son, Michael. The Beast Within may be viewed as a case study to review the signs of Neurofibromatosis type 2 (NF2), a hereditary condition most commonly associated with bilateral vestibular schwannomas, also known as acoustic neuromas. These benign tumors grow on the nerves of the inner ear and commonly cause tinnitus which is experienced by Michael throughout the movie as a cicada-like ringing. In the film, Eli and Caroline decide to confront their past and return to the small town of Nioba, Mississippi to hopefully discover some information about the man (Michael’s biological father) who sexually assaulted Caroline. The timing and nature of their search underscores 2 important facts; a) signs of NF2 usually develop in the late teenage years and b) NF2 is a hereditary condition. Interestingly, Michael may also demonstrate mucosal neuromas (fattened lips of the beast), which along with his pituitary gland “going out of control” (adenoma), is consistent with Multiple Endocrine Neoplasia (MEN) syndrome type 1.